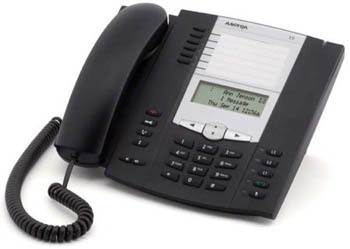 The Aastra 51i offers features and flexibility in an open-standards based, carrier grade basic level IP telephone. With a sleek and elegant design and LCD display the 51i is fully interoperable with the 3CX IP PBX platform, offering advanced XML capability to access custom applications and support for high-quality SIP communications. Part of the 5i Series of IP telephones, the 51i is ideally suited for light use small and medium business applications such as lobbies or common areas, where single line high-quality SIP communication is required. The Aastra 51i is equipped with XML browser capabilities allowing access to customized services and applications. Create internal service applications using development guides available from Aastra. This feature provides unlimited potential to customize the 51i to meet your specific business needs or vertical applications using the display keypad. With extensive storage capacity for personal directory, callers log, and redial list, the Aastra 51i can improve efficiency by providing more call information with the push of a button. Features such as shared call and bridged line appearances, call forward, call transfer and call waiting increase call flexibility and control. From initial deployment and configuration to future enhancements and upgrades, the Aastra family of IP telephones are designed to save your business time and money. Dual auto-sensing switched Ethernet ports eliminate additional wiring and simplify installations. Integrated IEEE 802.3af Power-over- Ethernet allows easy deployment with centralized powering and backup. Easily created configuration files, using any text editor, can be used to configure phones individually or centrally.